Location: Hampton Park, Melways Map 96. The best birding is Grids G8, G9 & H9. More birding is possible by walking further east to Grid J9. Access: Roadside parking approx. 700m along Coral Drive, off Hallam Road, south of Hallam and Pound Roads intersection. Facilities: Nearest toilets at Hallam Shopping Centre, Hallam Road. 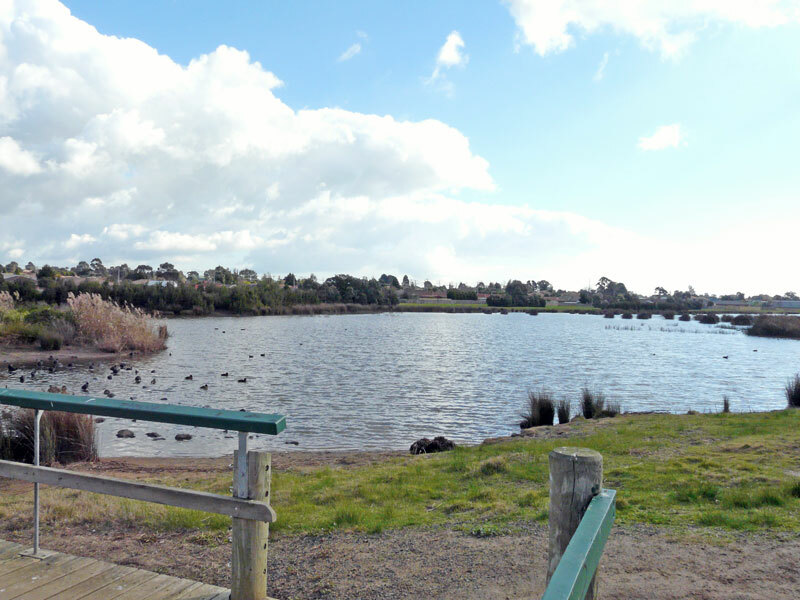 There are no formed paths around the wetlands but the area is open and walking is easy. Habitat: Mix of gums, wattles and brush. 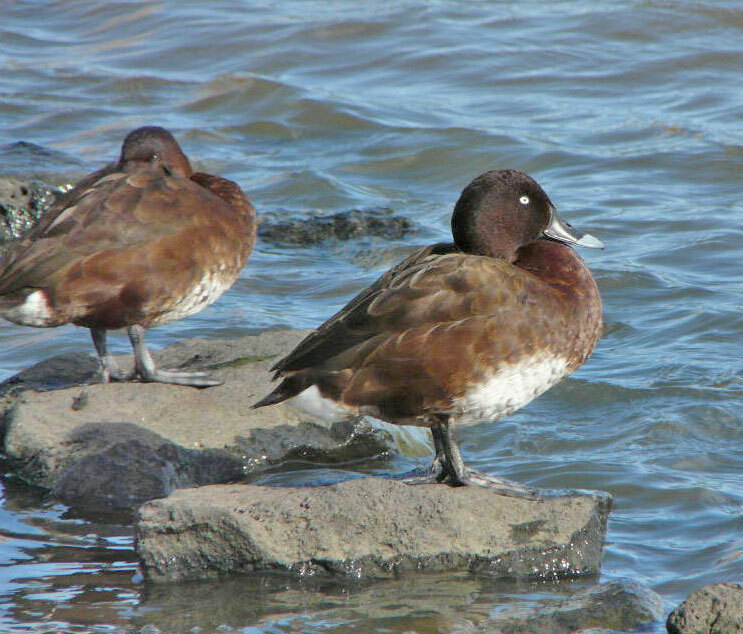 Wetlands – open water and reedy marsh areas. Adjacent residential plantings. Black Swan; Australian Wood Duck; Australasian Shoveler; Grey Teal; Chestnut Teal; Pacific Black Duck; Hardhead; Australasian Grebe; Hoary-headed Grebe; Rock Dove; Spotted Dove; Crested Pigeon; Little Pied Cormorant; Great Cormorant; Little Egret; Australian White Ibis; Straw-necked Ibis; Purple Swamphen; Dusky Moorhen; Eurasian Coot; Black-winged Stilt; Masked Lapwing; Latham’s Snipe; Silver Gull; Rainbow Lorikeet; White-plumed Honeyeater; Noisy Miner; Little Wattlebird; Red Wattlebird; Australian Magpie; Willie Wagtail; Little Raven; Magpie-lark; Australian Reed-Warbler; Little Grassbird; Welcome Swallow; Common Blackbird; Common Starling; Common Myna; House Sparrow. Pink-eared Duck; Blue-billed Duck; Little Black Cormorant; Pied Cormorant; Australian Pelican; Eastern Great Egret; White-faced Heron; Royal Spoonbill; Yellow-billed Spoonbill; Whistling Kite; Swamp Harrier; Brown Falcon; Baillon’s Crake; Australian Spotted Crake; Spotless Crake; Black-fronted Dotterel; Red-kneed Dotterel; Sharp-tailed Sandpiper; Galah; Little Corella; Sulphur-crested Cockatoo; Scaly-breasted Lorikeet; Musk Lorikeet; Eastern Rosella; Superb Fairy-wren; New Holland Honeyeater; Grey Butcherbird; Fairy Martin; European Goldfinch; Common Greenfinch.